Beautiful waterway view in this private home with 5 bedrooms and 4.5 bathrooms. Accommodates 10. Private outdoor pool. Access to tidal dock for fishing and crabbing, kayaking and paddle boarding, but water is not deep enough for boats. 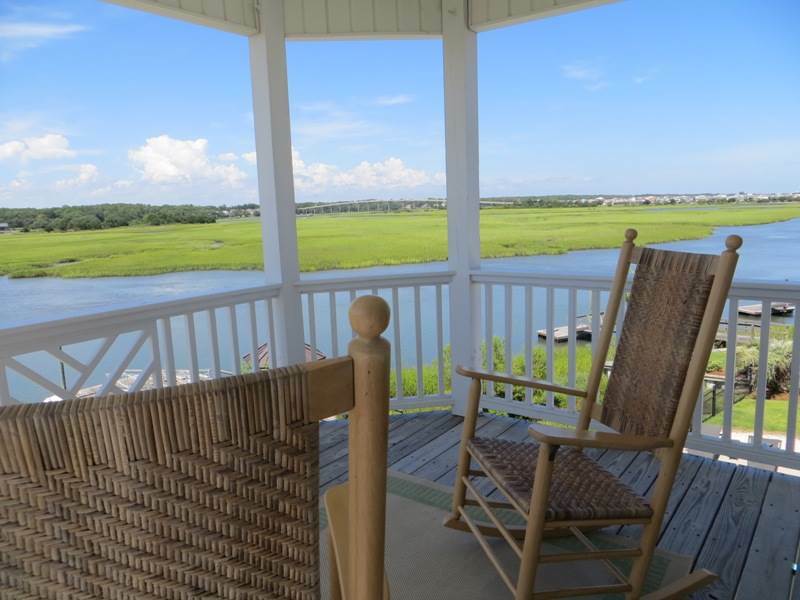 Beautiful views of the waterway and the OIB bridge. Well equipped kitchen, with dishwasher, range, microwave, stove, refrigerator, coffee maker and more. Additional amenities include washer/dryer, wireless internet access, flat panel TV in the living space with Blu-ray player and stereo, flat panel TV/dvd player in the master bedroom. Large, open comfortable living space. Very well appointed property with spacious bedrooms, plenty of outdoor furniture and neat little yard. All bed and bath linens provided with the rental. Non-smoking. Sleeps 10. 2T, Q, Q, 2T, Q. This is a NON PET friendly house but owner does bring their dog. We were at Ocean Isle for family reunion that required 4 houses. This one was the best by far The salt pool is wonderful and so refreshing. The furniture is comfortable, clean and up to date. Linens are supplied and the kitchen is well stocked. Best of all there is a lot of seating on the decks for a large group to enjoy beautiful sunsets. We enjoyed standup boarding on the canal but be very careful - the hidden oyster beds are treacherous, requiring several stitches. Loved using the Ninja in the kitchen for smoothies. You will have about a 2 block walk to the beach but we were not carrying toddlers, so the pool along with the peaceful mornings on the sound were much preferred to beach front for us.